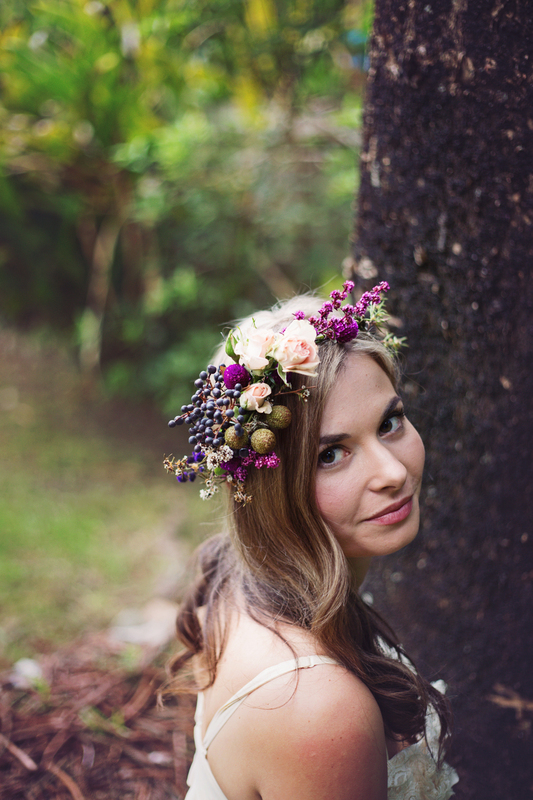 If you haven't noticed yet floral crowns are "in", in a big way. They're so bohemian chic and perfect for your wedding day. This is a beautiful, memorable way to style your hair that isn't too formal or traditional. The only tricky bit is that you'll have to make the floral crown in the days leading up to your wedding, but I've included tips on how to keep it looking as fresh as possible. Cut the stems of your flowers to 10 cm. Measure your head, bend and tape the vines to the appropriate size to make the base for your crown. Tuck away any untidy fly aways and make sure it fits. Arrange all your blossoms in a circle on the table before you start. This way you can play with the elements of your crown before taping them down. Tuck your large blossoms (roses and berries in this case) into the vines and secure with garden wire and floral tape. You should't need any more tape or wire after this point. You want your crown to have a focal point at the front with larger flowers and to taper away to tiny blossoms at the back. Start adding your smaller berries and native flowers. Secure these by weaving their stems in and out of the vines and tying them on by using some of your leftover vines. Continue all the way around the crown, making sure to use smaller blossoms for the back. Spray your floral crown with water to help maintain moisture, store in a tupperware container and place in the fridge. Your crown can be made a day or two before the wedding as long as it’s kept in the fridge. I've had crowns last for up to 5 days in the fridge, simply give them a spray of water daily.